I'm sure it will not escape your notice that apple pies are not cookies. I wanted to end the 12 cookies of Christmas on a nostalgic note, but I had run out of steam by today (Christmas Eve) and didn't want to mull through the motions of a meaningless kind of easy cookie just to make it to 12. 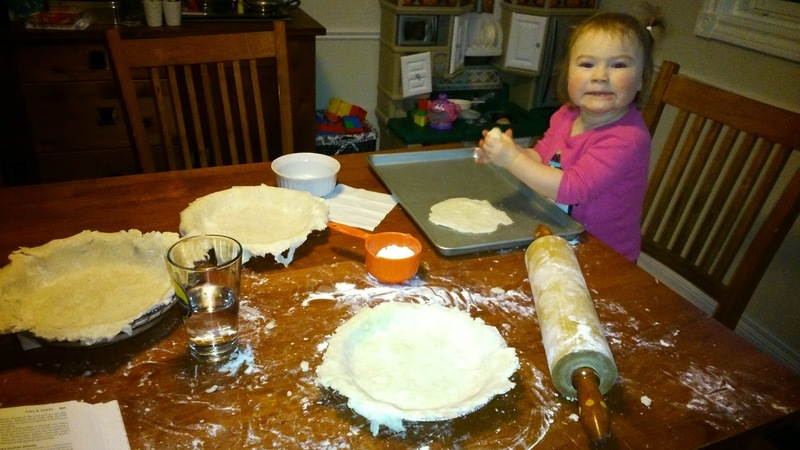 Instead, I thought I'd share a tradition in our family - baking apple pies from scratch. I was assigned to bring dessert to the Loftus Family Dinner. And although I don't make nearly as good an apple pie as my mother does, I get better every time I try. Incidentally, my own mother didn't learn to bake pies until she came to Canada, married my father, and learned from his mother. My grandma's apple pies were famous before my mother's, and although I have no illusions about my pies becoming as famous as my mother's or grandmother's, I do enjoy carrying on the tradition. I used the Joy of Cooking as a guideline. Here are a few key points. #1: Use tart apples that will hold their shape. I used Granny Smith. My mother swears the key to her apple pies were the wild apples she scavenged from the trees in the vacant properties near our house. #2: Read the chapter introduction in the Joy of Cooking on Making Fruit Pies. I am the opposite of a perfectionist and I love to cut corners and I often skim instead of reading. When I finally took the time to read the blurb about making fruit pies in the Joy of Cooking, I had a lot of Ah ha! moments and my pie-making game got upped instantly. #3: Add butter chunks to the pie filling before you put the "lid" on the pie. #4: Brush the top with milk and sprinkle with sugar before cutting the vents in the upper crust. #5: Bake with people you love. And don't be afraid to sacrifice a bit of dough and apples for the sake of a budding baker's education.